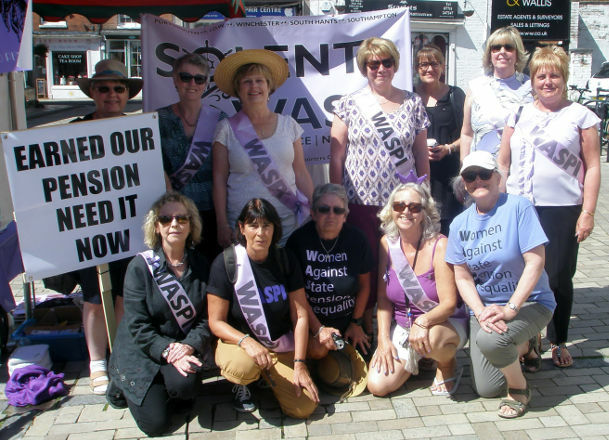 Solent WASPI women took part in a day of action, raising awareness of their situation and calling on candidates in the General Election across the region to support their cause. Members of WASPI (Women Against State Pension Inequality) have been calling on their local general election candidates to support their campaign. 3.5 million women nationally have been adversely affected by changes to the state pension age in 1995 and 2011. In Hampshire, this affects around 116,000 women and their families, some of whom are suffering severe financial hardship as a result. WASPI is campaigning for transitional or compensation payments for these women who were born in the 1950s. Friday, 26th May 2017 was the WASPI National Day of Local Action; more than 140 WASPI groups around the country took part. The Solent Group held an awareness raising event in Romsey town centre from 11.00am-2.30pm. They began with a minute’s silence to remember all those affected by the Manchester atrocity on Monday, 22nd May. The group set up a stand in the Cornmarket with posters, flyers, Solent WASPI information cards and banners of various sizes. In addition, small groups walked around the town talking to residents about the campaign and handing out flyers. They pointed out that some women have been forced to sell their homes. Some have had to try to re-join the workplace, but unfortunately without much success as it is often very difficult to find a job in your sixties. Women who are on their own for whatever reason are particularly hard hit. For example, divorce settlements were often calculated on a state pension age of 60. Consequently, many divorced women – particularly if they do not have an occupational pension – are finding it difficult to make ends meet. The SPA changes have had a major impact on women who are ill or suffering from long term health issues. Wendy, a Romsey resident, has recently had to cope with the stress of having cancer. She has no occupational pension so, in addition to the stress of her illness, she is being forced to sell her home. This is because she has no other income and her state pension age has been raised not once, but twice. Wendy says what has happened to her has been devastating. “We had hoped that Conservative candidate, Caroline Nokes – who was Parliamentary Under Secretary of State at the Department for Work and Pensions in the last Government – would be sympathetic to our cause but sadly she simply repeats the Government line. It is a line that is disingenuous and fails to deal with the issues. 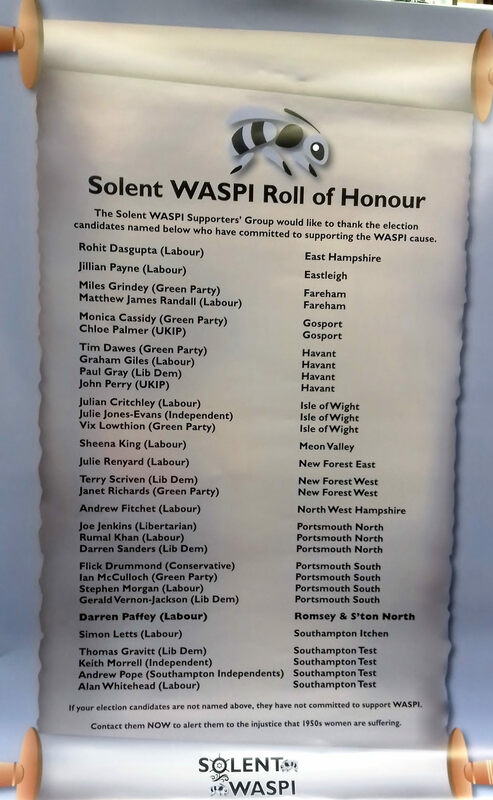 During the day the Solent group unveiled a Solent WASPI Roll of Honour with the names of 31 candidates in the region who have signed the WASPI Pledge to date. Candidate Pledges continue to arrive, the most recent being Eleanor Bell (Liberal Democrat, Southampton Test), Rosie Pearce (Green, Southampton Test) and Matthew Winnington (Liberal Democrat, Fareham). Solent WASPI Supporters’ Group ended the National Day of Local Action tweeting their thanks to all the general election candidates who have pledged their support. 1 Comment on "Local WASPI women take part in national day of action"
joined WASPI (£15 a year) then we maybe there could be an IW Group.